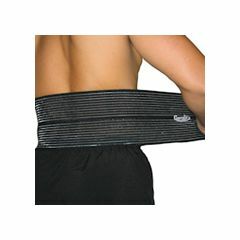 Lightweight support designed to reduce the risk of injury and back strain. Innovative vented material to release body heat. Durable. Comfortable. Breathable. Adjustable. Quality Materials. Daily Use. Helps with daily walking. Good in physical therapy. Weak Core Needs Support. Weak abdominal muscles. Stenosis of the Spine. Herniated Disc. Elderly. Due to severe Peripheral Neuropathy I am getting weaker. In order to slow down the progression I have physical and occupational therapy as well as daily walking. Due to my weight, my age, and my back problems walking for very long was not possible. With this item I recently was able to walk 9/10 of a mile and plan to do so as often as possible. At times I have terrible back pain. I put this belt around me and the pain goes away in about 15 minutes. Yes, I would buy this product again. I've had lumbar surgery and unfortunately I need additional help for cronic pain. I want to know sizes available. I'm about 38+ waist, male. How wide is this product? Will this fit around my 44;waist? is this back support one piece and how wide is it?